Worried for the health of their bees as well as loosing their honey(a court recently ruled that a German beekeepers honey was unfit for human consumption because it contained traces of GMO corn) French beekeepers invaded a Monsanto location demanding an end to GMO crops. There is a short video of this event in french here. Friday a hundred beekeepers occupied the site of American argo-chemical giant Monsanto in Monbéqui for several hours to demand that the government quickly ban GMO corn in France. The protesters left after the government re-affirmed their commitment to ban growing Monsanto 810. This ban has been in question since the end of November when the state council had cancelled the suspension of growing GMO corn, a suspension imposed by the government in February 2008. “The government is committed at the highest level to maintaining the ban on growing Monsanto 810, and notably for the next growing season.” the minister of Ecology told the AFP on Friday. Olivier Belval, the president of the French National Beekeepers Union reported that a representative of the prefect guaranteed the protesters that a safeguard clause assuring the ban of selling and growing this GMO will be made, as promised in November by Nathalie Kosciusko-Morizet the minister of Ecology. The beekeepers will be received next week by the ministers of Agriculture and Ecology according to Guy Kastler of the Confédération paysanne(Rural Confederation) which was behind this action. The beekeepers are worried by the risk that their honey will be contaminated by GMO corn and will be declared unsuitable for human consumption according to European policies. They want an immediate government decision, with a decree until the the safeguard clause is put into action. Some dressed in white with veils protecting their face brought two hives and smokers into the building before calling the Minister of Ecology by telephone. “We demand an order banning the sale and growing of Monsanto 810 and a ban of all GMOs that produce nectar or pollen” that could pollute honey, declared Jean Sabench, a beekeeper from Hérault, spokesman for the Confédération paysanne. Jean Sabench came for the survival of beekeeping, “already in peril”, but also for the survival of the bees, the disappearance of these essential pollinators will have heavy consequences on the environment and agriculture. The government promised “a new clause that will not be legally attackable” said the minister of Ecology. She said It could be made before the sowing season at the end of February. The Monsanto site at Monbéqui had been the victim of a reaping operation in 1999 by farmers of the Confédération paysanne. According to the French National Beekeepers Union, in 2011 the production of French honey is estimated at around 20 000 tons, similar to that of 2010. But this quantity represents a great decline from 1995 harvests (32 000 tons). I first noticed bees with deformed wings virus(DWV) crawling around in front of one of our stronger hives in the late summer of last year. We treated in the fall, and by spring symptoms had dissapeared. It was the strongest of our twenty hives this spring and we had to split it to try and keep it from swarming. By late summer(Sept. 1st) I once again started noticing bees with deformed wings. From this point in the season on, anytime I looked, I was able to find at least one if not a handful of damaged bees crawling around in the area directly in front of this one hive. Notice the mite on the bee in the above photo. 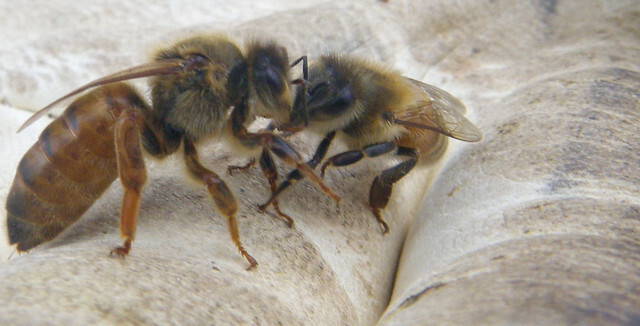 Mites help transmit DWV and are the cause of more severe infections as they harbour a much higher concentration of the virus than is found in the bees themselves. 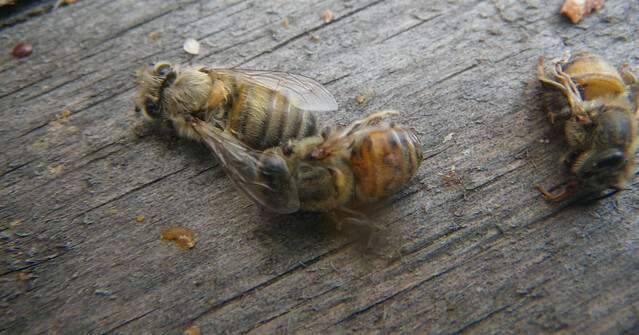 Bees with deformed wings are expelled from the hive and typically have a life span under 48 hours. Seeing large amounts of DWV is a clear indicator a hive is suffering from a serious varroa problem. 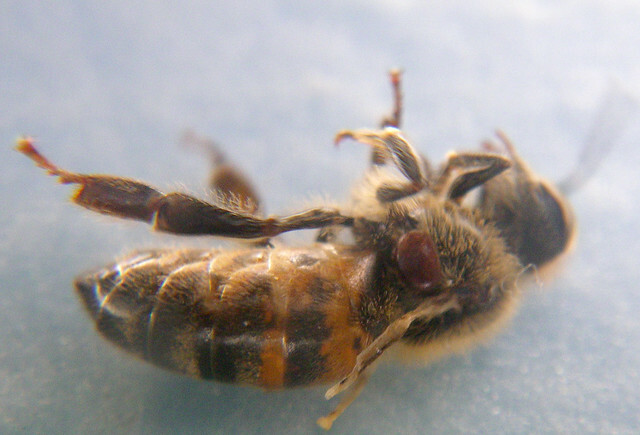 Bees with DWV may also have really stubby short abdomens. In some cases I see the short abdomens without necessarily seeing visibly deformed wings. I believe these stubby bees with healthy looking wings, are also incapable of flight. This graphic novel follows Nyuki through the various life stages of a bee. The story is written and drawn by bioligist and hits on a wide variety of scientifically based fact in the process of telling the story. Even those who've read a great deal about bees might learn something new here. The Google Books preview is here. 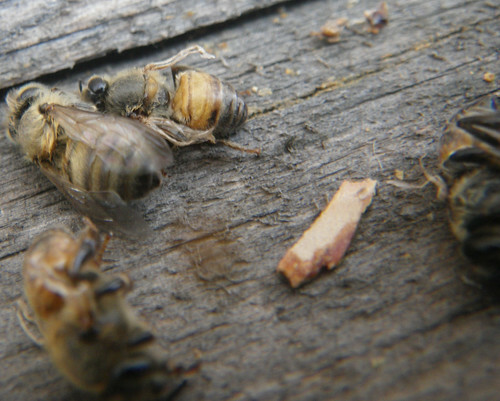 Detailed look at the life cycles of both the honey bee and varroa Mite. Treating varroa mites by sugar dusting. 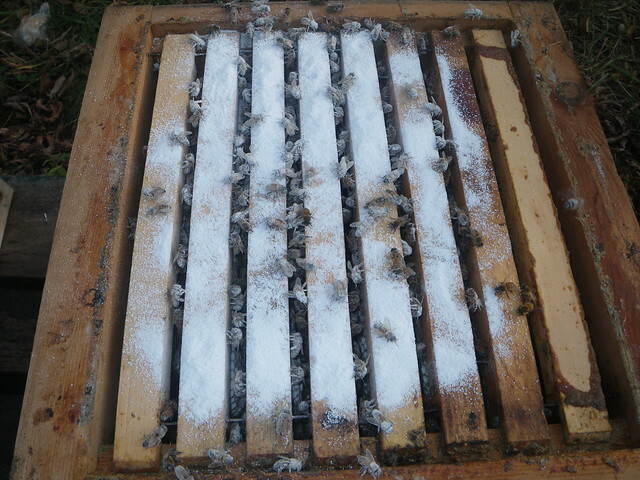 Sugar dusting bees is a non-chemical, relatively harmless approach for dealing with varroa mites. 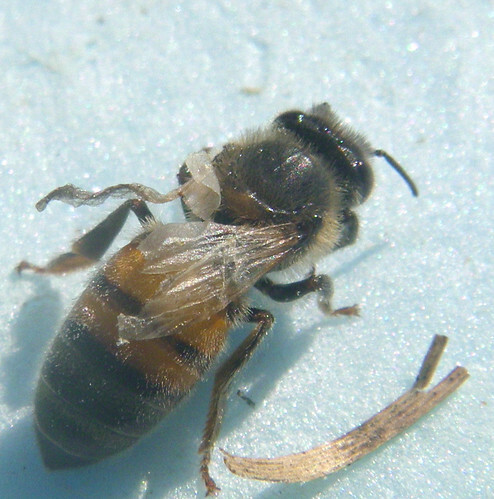 The concept is that covering the bees with sugar will make things slippery for the mites and stimulate grooming behaviour in bees. It's widely accepted that sugar dusting will successfully knock down a portion of the phoretic mites, that is those mites riding on the adult bees, but not those reproducing under capped brood. As such, this approach is most useful to employ during a queenless period after the old queens brood had emerged but before brood from the new queen is capped. Generally sugar dusting is viewed as just one component of an Integrated pest management system, useful for keeping numbers down, but one shouldn't expect it to function as a magic bullet that will solve all your mite problems. The effect upon the hive is immediate and obvious. Bees run for cover and once sugared, stop whatever else they were doing and proceed to clean the sugar off. I've typically tried this using about 1 cup of powdered sugar per deep brood box. In my experience, most of the mite drop will happen in the first 15 minutes. This photo is an example of what can be pulled out of the bottom of the hive in 15 minutes. In the first hour I'm usually able to recover about 1/3 of the sugar from the bottom board. This technique works best in tandem with a screened bottom board, as it knocks off the mites but doesn't kill them. 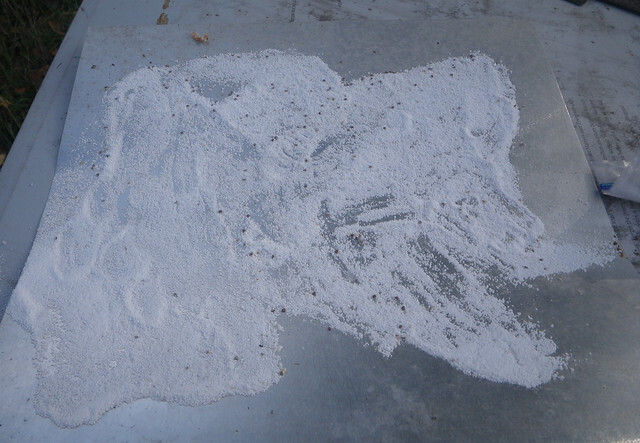 You can slide something like cardboard into the entrance of a solid bottom board when sugar dusting so the mite can be easily removed after the drop. The main drawback to sugar dusting is that the bees do appear to devote a fair bit of energy cleaning out the sugar. The following video shows a colony actively in clean-up mode after sugar dusting. The video was shot at the end of November, there was little forage available this time of year, as such the hive entrance had been very quite prior to dusting. "The take-home message is that the results of this series of tests lead me to question the reliability of either natural mite fall or the alcohol wash (or ether roll) as monitors of mite infestation level! It appears to me that a whole-colony mite drop accelerated by sugar dust (or other mite dislodging agent) is likely the most accurate field-practical way to determine a colony’s mite level." When multiple Queens hatch you might expect them to battle it out, however, in some cases extra queens may simply be thrown out of the hive. We found this queen in the tray of a screened bottom board approximately two weeks after two chewed open supersedure cells were found. We held onto this queen till we found that the hive did in fact have a healthy queen busy laying eggs. We wondered if one of her front legs had been injured as she seemed to keep it raised, but other than she seemed perfectly healthy if unattractive to the hive(just a lone nurse bee showed her any interest). Signs of a queenless swarm? Last week we were called to collect a swarm. There was no single cluster. Bees were on the ground in two different locations and there were a few up in a tree. The bees were spread out and fanning. While it was hot, it's likely they were searching for queen scent rather than trying to keep cool. Even once we got them into a nuc box they spread out over the available surface of the box rather than clustering. They became very interested in the bee gloves of my friend John and actually started running en masse towards him when he first started looking for a queen. (You can see this in the video. Unfortunetly it's a little obscured as some bees had also become very interested in my camera at the same time.) I don't expect the residual bee smells on the gloves and camera would have been nearly as interesting if they had a queen giving them the pheremones they were really after. We collected the bees and joined them with one of our weaker colonies. The colony we joined it with was a split with an old queen removed from a hive that had supersedure cells. We placed the swarm on top in a seperate box with a sheet of newspaper inbetween. Five days later we opened the hive to discover: the bees had already eaten two holes through the paper, one dead queen being mobbed by bees and one healthy looking queen going about her business. We couldn't believe it. We searched for other explanations. Is it possible a virgin queen drifted back to the wrong hive from the other half of the split? Seems unlikely. So maybe the swarm did have a queen afterall. Upon reviewing the video again, I noticed relatively few bees fanning at the begining as compared with the end when some bees were already placed in a nuc box. Perhaps that should have been seen as sign the bees were just trying to keep cool vs. actually wondering about the current location of their queen? Lesson? Check and double check when there is any doubt about a queens existence.